There are 7 pieces in the collection of the deluxe limited edition book series and if you get all 7, you get this piece as a bonus...so the entire set is $2975, although you can also get the two additional pieces subsequently released as well matching the others! The Half-Blood Prince deluxe image is a rare piece indeed and the perfect special image as a bonus to the set! One consequence of Lily's loving sacrifice was that her orphaned son had to be raised by her only remaining blood relative, his Muggleaunt Petunia Dursley. While in her care he would be protected from Lord Voldemort, due to the Bond of Blood charm Albus Dumbledore placed upon him. This powerful charm would protect him until he became of age. 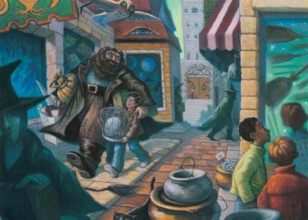 As the only known survivor of the Killing Curse (up to that point), Harry was already famous before he arrived at Hogwarts School of Witchcraft and Wizardry. 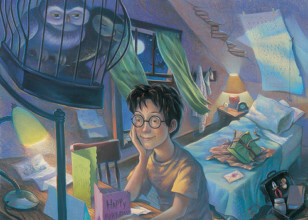 On his eleventh birthday, Harry learned that he was a wizard. He began attending Hogwarts in 1991 and was Sorted into Gryffindor House. While at school, Harry became best friends with Ron Weasley and Hermione Granger, and later became the youngest Quidditch Seeker in over a century and eventually the captain of his house's team, winning two Quidditch Cups. 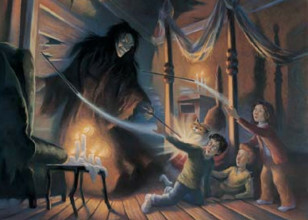 He became even better known in his early years for protecting the Philosopher's Stone from Voldemort, saving Ron's sister Ginny Weasley, solving the mystery of the Chamber of Secrets, slaying Salazar Slytherin's basilisk, and learning how to conjure a corporeal stag Patronus at the age of thirteen. In his fourth year, Harry won the Triwizard Tournament, although the competition ended with the tragic death of Cedric Diggory and the return of Lord Voldemort. During the next school year, Harry reluctantly taught and led Dumbledore's Army. He also fought in the Battle of the Department of Mysteries, during which he lost his godfather, Sirius Black.